Although formerly referred to as Dendranthema morifolium, plant taxonomy now classifies chrysanthemums as Chrysanthemum morifolium. This is a case where the genus name has become such a commonly used name that capitalization is often abandoned (as will be the case in this article). 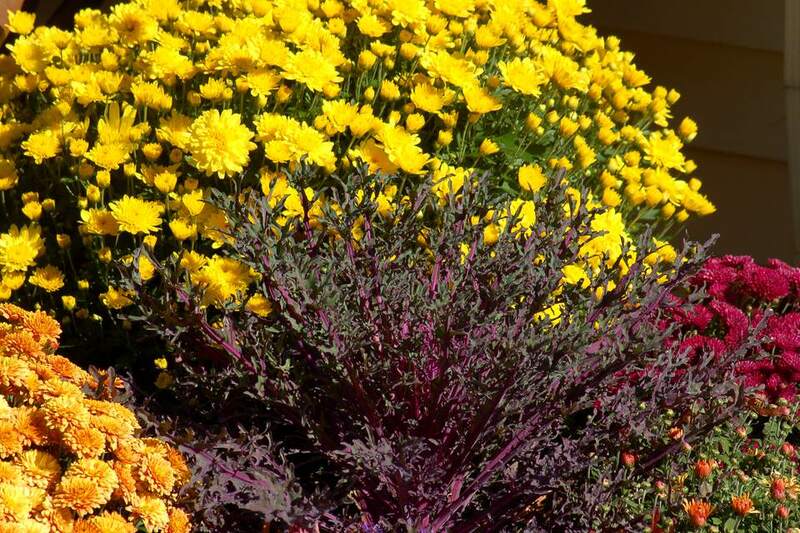 Other common names for these colorful fall characters are based on the shortened version ("mums") of the genus name. This one will hear "hardy mums" (or "garden mums"), the focus of this article, versus the less hardy "florist mums." These plants are usually considered herbaceous perennials. However, if you wish to grow chrysanthemum flowers in your area as perennials, select an appropriate cultivar (which, in cold climates, will mean one of the hardy mums). Your local county extension can offer advice in this matter. A spring planting is best, giving them time to become established before winter. Chrysanthemum is from the Greek, chrysos (gold) and anthos (flower). These plants come in a wide variety of floral colors, including not only gold but also white, off-white, yellow, bronze (rust), red, burgundy, pink, lavender and purple. Mum plants can grow to be 2 to 3 feet high, depending on the cultivar and growing conditions. Chrysanthemums also come in many flower forms; that is, they are often grouped by the shape and arrangement of the petals of their blooms. The most popular flower form is the "decorative," which is so packed with long, broad petals that you can hardly see the center. Chrysanthemums are grown in planting zones 3 through 9. Their hardiness, however, varies greatly, depending on the cultivar or the nursery series. To obtain the types that are the hardiest, search in the plant catalogs for nursery series such as Mammoth. Types like this have been developed specifically for Northern gardeners. Plant in full sun and well-drained soil, enriched by compost. Chrysanthemum flowers are "photoperiodic"; that is, they bloom in response to the shorter days and longer nights experienced (in the Northern Hemisphere) in fall. Therefore, do not plant chrysanthemum flowers near street lights or night lights: The artificial lighting may wreak havoc with their cycle. Also, do not overcrowd chrysanthemums: Good air circulation reduces the chance of disease. As mentioned before, there are "hardy mums" and "florist mums." Hardy mums put out stolons. Florist mums put out few or no stolons and are less likely to over-winter in cold regions. Also mentioned above was the classification of chrysanthemums by flower form. But adding to the diversity are differences in growth habit between cultivars. For instance, the "cushion" type is a popular group; they exhibit a compact growth habit. By every third spring, divide chrysanthemums to rejuvenate them. Fertilize chrysanthemums once per month through July (any growth after that is too late to harden off for winter). Hardy mums will be even hardier with winter protection. Mulch them and create a microclimate to shelter them from winter winds. If you can't plant them on the south side of your house, you should build a modified version of the shrub shelters used for winter protection for shrubs. Do not prune the plants in fall: Existing branches offer the roots protection. Pinching chrysanthemums yields compact, bushy plants with more blooms. "Pinching" means removing the tips of new growth, thereby stimulating the plants to send out side-shoots. It is called that because, on non-woody plants, one can generally accomplish the task simply by grasping the stem (at the targeted spot) between thumb and forefinger and severing it with a pinching action. Start pinching in the spring when the new growth has reached 4 to 6 inches in length. After that, every 2 to 3 weeks, pinch the center out of any more growth when it reaches 6 inches. But stop pinching chrysanthemums around the beginning of summer, or else bud formation will not occur soon enough to ensure flowering for fall. Chrysanthemum flowers have traditionally been boiled in China (their place of origin) to make a tea, used in folk medicine for influenza patients. In landscaping, chrysanthemums are valued for the fact that they bloom in fall, helping you to achieve four-season interest in your yard. They look best planted in a mass (but for plant health, do not overcrowd). Chrysanthemum flowers are also a favorite of florists for arrangements, due to the longevity of their blooms. Growing these plants for optimal display value requires getting a few things right; they are fussier to grow than many other plants. In the North, it all begins with buying cultivars that are hardy mums in your area. That is, for you, "hardy mums" is more than a nickname: It is what you truly need. Potted chrysanthemum flowers are sold by the millions at nurseries in fall because they have become a staple for outdoor fall decorating. But, first of all, what you are buying, in this case, are not necessarily cultivars meant to grow locally as hardy mums: They may only be meant to be displayed for a short period. Secondly, because these chrysanthemum flowers are bought specifically for fall flower displays, even folks living in zones warm enough for them to be perennials often fail to plant them early enough to allow them to become established. They should be planted at least 6 weeks before a killing frost, and even that may not be soon enough. Cultivars that bloom in September by late June. Cultivars that bloom in October by July 4. Since it is so important to know what cultivar you will be working with, it is wiser to buy mail-order hardy mums (single-stemmed rooted cuttings) from a catalog and plant them in spring, rather than planting potted mums that you have purchased from farm stands in fall. In a good catalog, you have all of the relevant information in front of you. Also, spring planting gives the plants longer to become established.